Did you know there is a money-saving app that will literally pay you cash back for buying everyday items? You can even team up with your friends and family to earn big bucks. 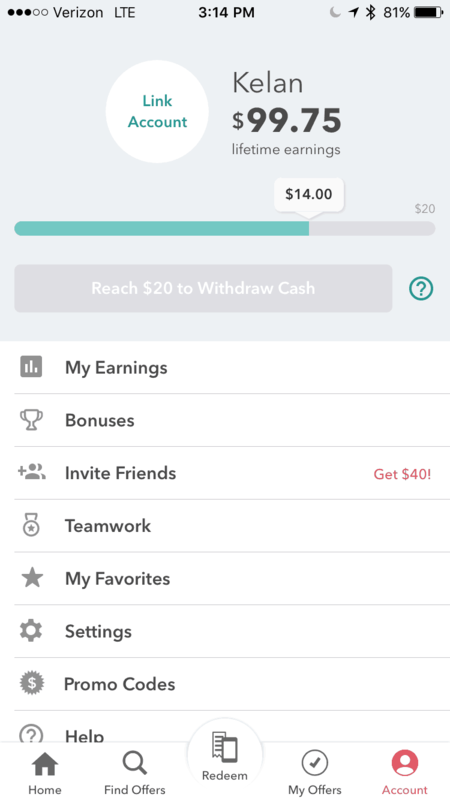 In this Ibotta review, I’m discussing how to get started with their cash-back program and quickly put money back in your wallet where it belongs. We love Ibotta because it is super easy to use and allows for multiple ways to save money. 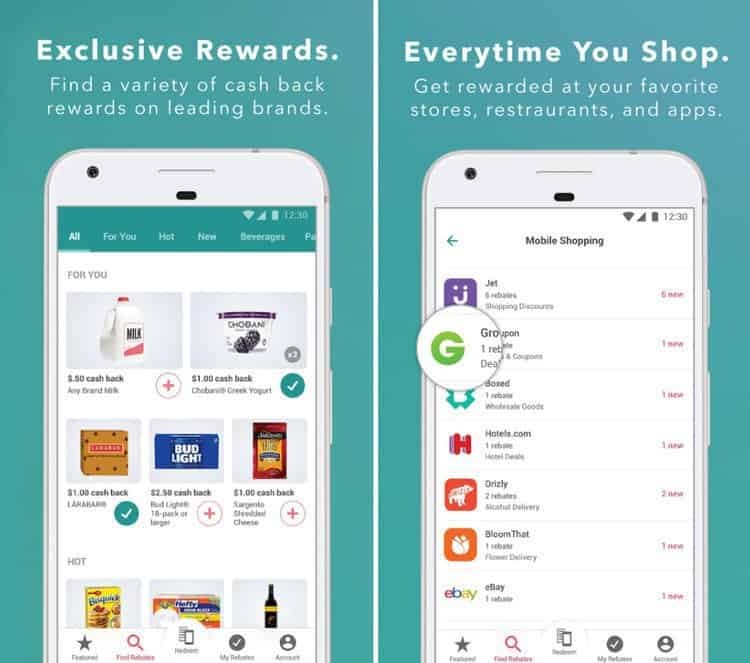 If you are like me and do the majority of the shopping for your household, you are going to want to download Ibotta before your next shopping trip. 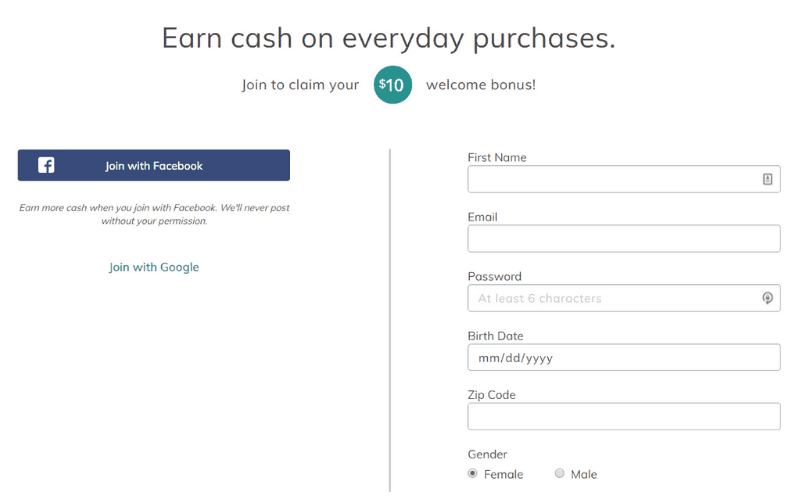 Ibotta is offering a HUGE $10 cash-back bonus for new users, so take advantage! After reading this Ibotta app review, I’m convinced you’ll want to sign up. How Much Time Does Ibotta Take? Ibotta vs. Ebates: Which is Better? Is Ibotta Only for Grocery Stores? Are There Dangers of Ibotta? Can I Refer People to Ibotta? Do you Have an Ibotta Referral Code? If you’re reading this article, you probably have already heard of what Ibotta is, but if not, no worries. This Ibotta review will take you from not knowing how Ibotta works to understanding how to implement it in your daily life. Ibotta is a FREE app that rewards you for shopping for brands you already purchase. One way Ibotta separates themselves from other money-saving apps is that they let you earn cash back. There is no point system for rewards where you are waiting for your points to add up so you can claim your reward. If you’re a savvy shopper like I am, you go where the best deals are. Well, Ibotta can help by providing you with an updated list of the best deals around. In our household, normally off-brand products are the savvy way to go. However, Ibotta provides us with cash back on name brand products that make them the same price as off-brand products. Plus, we still earn cash back on items belonging to any type of brand. Done are the days of clipping out coupons! Those “coupons” are now available through the app with no cutting or storing of the coupon. This app is seriously gold when it comes to saving money. Ibotta also has team rebates where you work together to earn cash back. For example, let’s say you’re on a team. 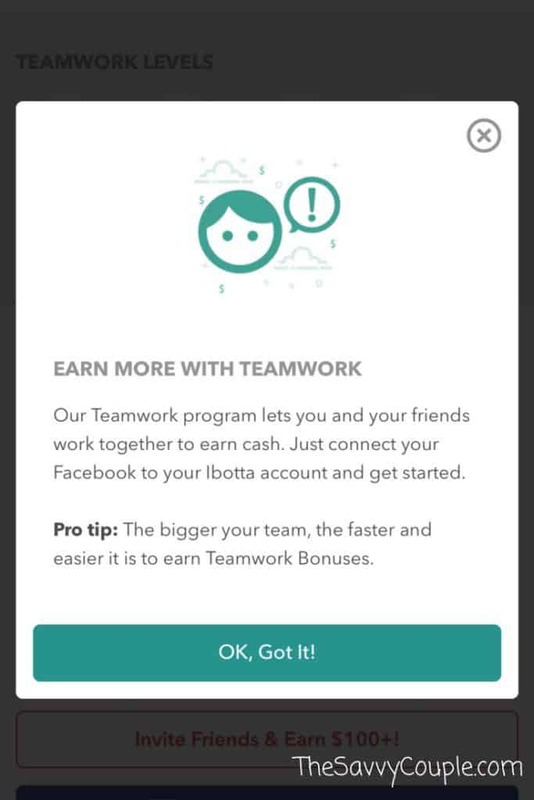 If your team earns $10 in a month, and you earned $5, Ibotta will give you a bonus of $2! The more your team works together to earn cash back, the more you are going to earn through the bonus tiers. Join the Savvy Spenders Team to start earning some serious cash back! Ibotta will take care of the rest! They will match what you have purchased to the receipt you have uploaded and boom! In less than 48 hours you will have the money in your account. When your account reaches $20, you will be able to withdraw your money. If you open an account using our exclusive link, then you will already be halfway thanks to our $10 sign-up bonus. Getting your money has never been more simple. If you use companies like PayPal or Venmo, you can just link your already existing accounts. This is my preferred method because you will have your cash back within 24 hours. If you do not have either of those services, you can get your money transferred into gift cards. Some of my favorite places like Target, Walmart, iTunes, and Sephora have gift cards available. Uploading your store receipt is not the only way to earn using Ibotta. I have a loyalty card at all the places I shop at. By linking your loyalty card to one of the matching stores on Ibotta, you will earn even more. You use the same process mentioned above. 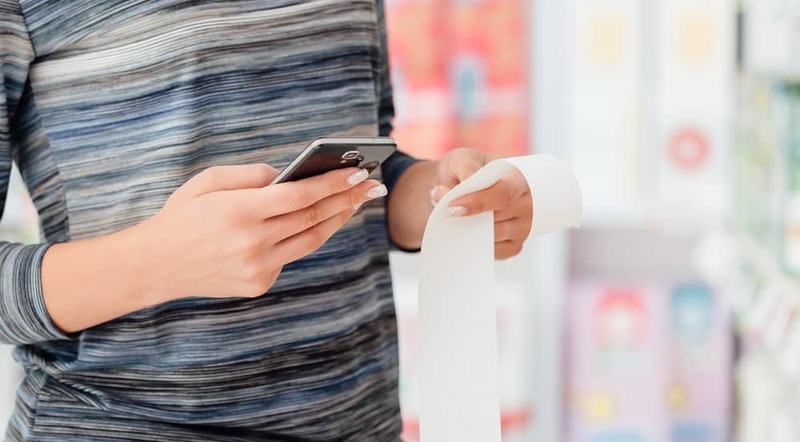 However, at the end, when you go to finish your purchase, you’ll be prompted to add your card by scanning it or adding the phone number linked to the account. The last way to earn is one of my favorites because we do a lot of online shopping. Ibotta partners with tons of mobile apps including Amazon, Groupon, Hotels.com, and more to offer cash back on your entire order! Simply find the app you want to use in the “Mobile Shopping” section and select “Shop.” Then, you’ll make a purchase like normal. Ibotta will notify you of your pending rebate credit. This easy way to save on mobile purchases is a real game-changer! You’re probably wondering if Ibotta is the right fit for you, so I wanted to dedicate an entire section to you! As a new mom myself, Ibotta has been amazing, but I also want to discuss some of the negatives. Here’s a quick Ibotta hack to fix #1: if you put an arrow next to the item that’s eligible for a rebate, it helps the processing program pick up the item better, which means you get some money back. I’m sure you have questions and I’d be surprised if you didn’t. Hopefully, I can answer all of them, but if not, leave them in the comments below. In fact, only a few minutes. For Ibotta to make money, they include advertisements and videos in between you uploading different items to get the rebates. Each video is about 15 to 20 seconds, but the whole process for about 15 items shouldn’t take you more than 5 minutes. As mentioned right above, they get paid by advertisers for including their promotions on the app. They also make money from the companies for referring you to them. But, more important than those two ways is realizing that none of those ways above impact your ability to make money with Ibotta. Just because they make money doesn’t mean you shouldn’t earn some back. In a week, you can expect to save about $5 to $10. While that doesn’t seem like that much, remember that you can also combine it with your couponing efforts to maximize your savings. This is an easy way to save money every week. Not to mention, if you use consistently use Ibotta, it certainly adds up. If you earn back the savings above, you could get rebates for upwards of $260 to $520! That’s a whole lot more than you had before with only a few minutes of extra work. If you pay for your grocery items with a cash-back credit card, you’re saving money on top of your savings. Talk about a win-win situation. You can also combine Ibotta with several of our other 100+ ways to save money to really maximize your savings. When you save money, you can work more healthy foods into your grocery budget. In fact, we have a whole Ebates review you can read to get the full scoop. Basically, Ibotta is focused around grocery shopping while Ebates is focused around retail outlets and clothing shopping. But, just because Ibotta started out in the grocery industry doesn’t mean they’re limited to it. They’re constantly adding new partners such as Groupon and hotel companies. Both can be integrated into your daily shopping life and both are money-making apps for the go. Ibotta will pay you once you reach the $20 threshold. That should be within a month if you use it every week. But, if you sign up for Ibotta with our special deal, you’ll instantly get $10 toward that threshold. Once you get there, they will pay you by PayPal or Venmo (and you probably already have one or both of those). All you have to do is link up your account and the payment can be sent your way. I typically get mine in about 24 hours, which is a great turnaround for cash-back companies. While that’s how they started, they do more than just supermarkets now. You can earn cash back on companies like Groupon, hotels, and even liquor brands. They’re constantly adding new partners, so make sure you sign up to find out about the latest additions. I use it all the time to save money on groceries. I would never recommend anything unsafe. Aside from an occasional instance of being locked out of your account, most people (including me) enjoy the app and consider it to be a legitimate way to make money online. You may be tempted by all the coupons and deals you see, so the only danger is controlling yourself. Just because you can get cash back on an item doesn’t mean that you have to purchase it. Stick to your grocery budget and if you don’t have one, we can show you how to budget. I’m not always the most technologically adept, but I think it’s super easy to use the platform. In fact, it’s one of the better-designed cash-back apps out there. It’s simple to use on the go and you won’t have to fret about searching your wallet for all your coupons. Not only can you do that, but it will earn you money as well. For every 5 friends, you can get to sign up for your team, you’ll get $25. This is perfect for your whole family to partake in, or you can even start a team for your friends. You can also receive a teamwork bonus if you save enough. Simply click this link, you’ll be directed to a page that should look like the following. Once you fill out this page, you’ll be good to go! Make sure you download the app on your mobile device to use in the supermarket or store. Glad you asked. 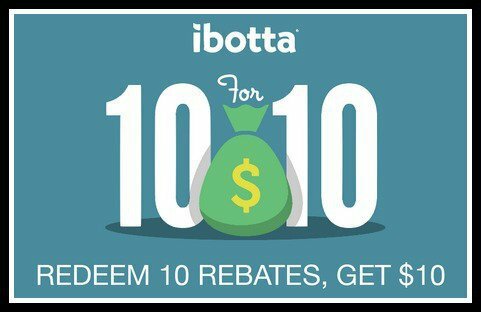 You can sign up for Ibotta and earn $10 cash back immediately. It’s a great way to get started! There are many cash-back apps out there but we have found Ibotta is the most versatile. Its user interface and simplicity make earning cash back easier than it’s ever been. If you have not downloaded the Ibotta app yet, what you are waiting for!? This app is great for quick cash back on purchases you are making already. Connect with other Ibotta users and join their team to earn even more. There is nothing like saving money with your friends and family! In just 24 hours, you can have more money in your bank account just for shopping. Sign up for Ibotta today and let me know how much you like it! I also want to hear how much money you’ve saved on groceries through using it. Thanks Carrol! You are welcome back anytime! I love using Ibotta for my grocery shopping and literally…any shopping I do! We had to buy a bunch of stuff this morning for a ‘Friendsgiving’ tonight and after I entered everything on the app and scanned my receipts, we ended up getting $7 back for our shopping trip at Target and Whole Foods! Plus, you have got to love the referral bonuses! Great review! Totally Ibotta is incredible. It’s helped us save so much money over the last year. Have fun at your Friendsgiving!